Just in time for the launch of Apple's LTE-capable iPad mini and fourth-generation iPad, AT&T this week turned on its 4G LTE network in 24 markets across the U.S. The announcement of the 24 new markets comes as AT&T also began sales of Apple's latest iPads, which feature high-speed 4G LTE radios, along with the iPhone 5. Downriver Wayne & Monroe Counties, Det. Saratoga & Saratoga Springs, N.Y.
AT&T said Friday that its 4G LTE network covers more than 150 million people in 103 markets across the U.S., a number that more than doubles the company's LTE coverage as of the end of 2011. More expansions are planned through the end of the year. 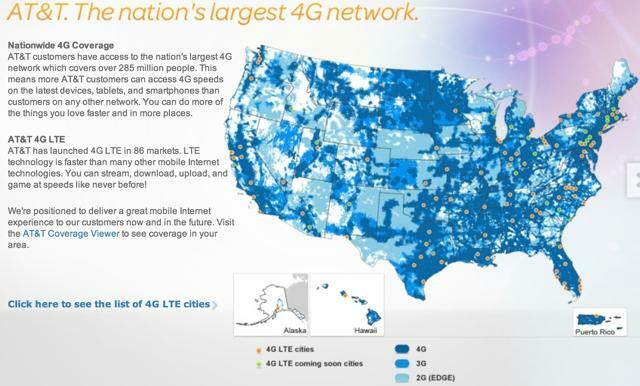 AT&T plans to have its LTE network reach 250 million people by the end of 2013, and 300 million by the end of 2014.